Seward Alaska Fishing Charter SLAYFEST!!! 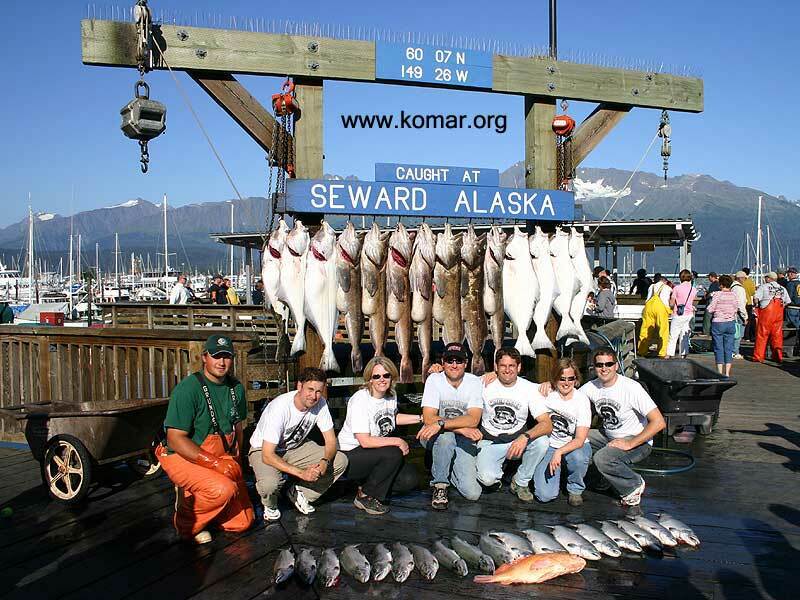 Seward Alaska Fishing Charter Slayfest! My family had surprised me on my 40th birthday when they all showed up and we we hiked Longs Peak ... so turnabout was fair play a few years later for my younger brother Kurt - aka Captain Crudd! So we surprised him on Seward Alaska fishing charter - he thought he was just going fishing in Seward with his wife Mary and sister Stephanie - unknown to him, the other three bro's were showing up. We flew into Anchorage Alaska a few hours before he arrived, and drove down beforehand - read more at the Seward surprise - "what the heck are you guys doing here?!?" Our boat charter left the Seward dock in the early dawn light, using the ship's onboard GPS and rader for navigation through the dense fog. After a couple of hours, we arrived at our spot, and had our first taste of Seward Alaska salmon fishing ... FISH-ON in the first minute! With six of us fishing, there were several occasions when three of us were fighting (about 10 pounder) silver salmon at the same time. We had bagged our limit of 3 each in about an hour. We then motored over to another spot for some Seward Alaska halibut fishing. We caught a bunch of these (although no monsters), but we made up for it by landing some 30+ pound Alaska Ling Cod - Kurt's Alaska comment when I pulled this first one up was "It's a HOG!" Finally, we even caught one yellow eye rockfish or more commonly known as Red Snapper - a very colorful fish. There were even some alaska birds that were "fishing" out there plus we caught a fleeting glimpe of a nurse whale. As can be seen in the picture below, it was a "slayfest" as we returned on our charter boat with over 400 pounds of fish along with a great time/memories - Happy 40th birthday Kurt! Charter Fishing in Seward Alaska! A couple years later, Kurt went up for the Seward Jackpot Halibut Derby ... and his wife Mary pulled in a monster. Also check out some nice pictures of 'em doing some Alaska River Fishing. Finally, watch Kurt get sprayed by a Humbolt Squid! In August, 2013, we visited again and did an awesome hike to the Harding Icefield.